A rose is a flowering shrub of the genus Rosa, and the flower of this shrub. There are more than a hundred species of wild roses, all from the northern hemisphere and mostly from temperate regions. The species form a group of generally prickly shrubs or climbers, and sometimes trailing plants, reaching 2–5 metres tall, rarely reaching as high as 20 metres by climbing over other plants. The name originates from Latin rosa, borrowed through Oscan from colonial Greek in southern Italy: rhodon (Aeolic form: wrodon), from Aramaic wurrd?, from Assyrian wurtinnu, from Old Iranian *warda (cf. Armenian vard, Avestan warda, Sogdian ward, Parthian wâr). Rose hips are sometimes eaten, mainly for their vitamin C content. They are usually pressed and filtered to make rose-hip syrup, as the fine hairs surrounding the seeds are unpleasant to eat (resembling itching powder). They can also be used to make herbal tea, jam, jelly and marmalade. A rose that has aged or gone rotten may not be particularly fragrant, but the rose’s basic chemistry prevents it from producing a pungent odor of any kind. 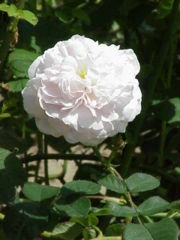 Notably, when balled and mashed together the fragrance of the rose is enhanced. The fragrance of particularly large balls of mashed roses is enhanced even further. Rose shrubs are often used by homeowners and landscape architects for home security purposes. The sharp thorns of many rose species deter unauthorized persons from entering private properties, and may prevent break-ins if planted under windows and near drainpipes. The aesthetic characteristics of rose shrubs, in conjunction with their home security qualities, makes them a considerable alternative to artificial fences and walls. 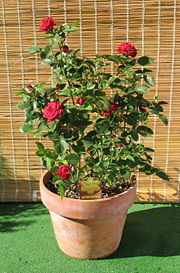 This website, www.rose-bushes.com, is a tribute to roses and the rose bush. We’re always looking for more information about rose bushes, so if you’d like to help contribute photos of your roses, an article, or other information, please let us know.